The new stable building is ready, and with its green doors and pink windows, it looks incredible. Lissi and the other girls can’t wait. The horses are in big stalls, and they have bales of straw and feed, but they all want to ride out first! 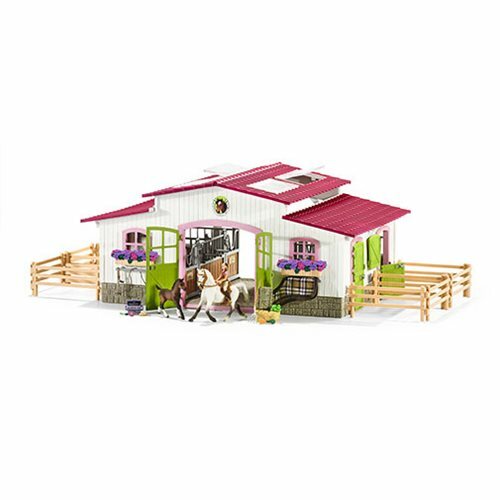 This amazing Horse Club Riding Center Playset features a roof with paddocks that become an open riding arena, a moveable roof window, fence parts that can be connected in any way, hay racks, drinking troughs, a tack holder, and more. Plus two horses and a rider figure. It's tons of fun! 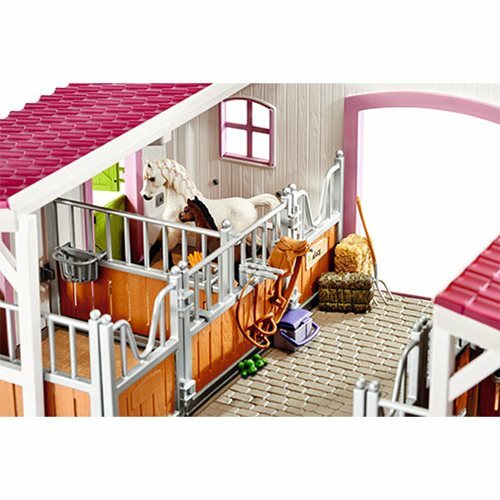 The playset includes a riding center, 12 paddocks, 2 flower boxes, an Arabian mare, an Arabian foal, a leisure rider, a leisure saddle, a bridle, blanket, a headstall, hay, 4 hay feeders, 4 drinking troughs, 4 saddle holders, a beige massage brush, a harness, a hoof pick, a grooming box, a carrot, a green apple, a pitchfork, and a sticker! “Finally! The new stable building is ready!” Excitedly, Lissi gets into the car. Her mum sets off. “Hopefully, it really is as beautiful as Mr. Miller, the owner, promised!” hopes Lissi. She leaps out the instant they arrive at the stables. “Wow! It’s even more beautiful than I imagined!” With its green doors and pink windows and window frames, the stable building really does look incredible. Lissi immediately runs from the car to the stable building. Her beloved Arab mare, Stella, is in one of the big stalls. “I missed you so much!” she exclaims. The two days they'd had to wait before they could finally see each other again had felt like ages. She embraces her horse and fetches the feed box with apples and carrots. She feeds Stella, and then the two of them can finally ride out. What a wonderful day! 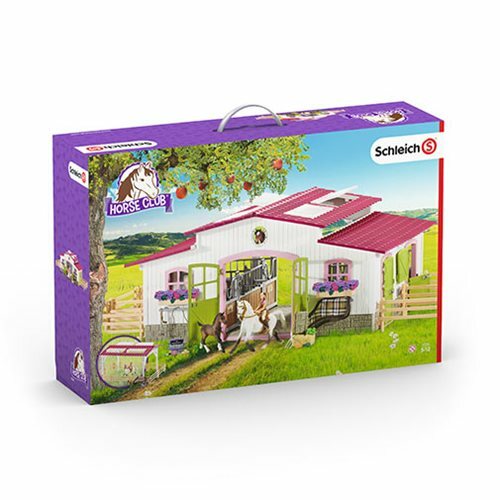 The sun is shining, a young Arab foal is prancing around the paddock, the birds are singing, and Lissi is delighted by the new stable building. Later, she'll brush and feed her mare again and cover her in her special present - a brand-new blanket!